There are plenty of songs that have not yet been released. Geffen and the remaining members of Nirvana did a great job when they put out From the Muddy Banks of the Wishkah. But, still where are the songs that not many people have heard??? Songs like PenCapChew, Help Me, Talk To Me, Opinion, and more. Maybe they are afraid people wont like the poor sound quality. This might be true for normal music listeners but, I think that wouldn't be the case with the fans who have stuck with them. There is also a lot of very good concerts that have been recorded. Maybe someone could talk them into releasing a whole conert CD instead of a collection of songs. I've heard rumors of more to come, lets hope its true. Here are some examples of unreleased songs Geffen has yet to give to us. you may notice that some song names are incorrect or things like that...what I decided to do was to label them exactly as they are label on the cd, sorry for any confusion. I am providing these for the sole purpose of providing News to Nirvan fans. 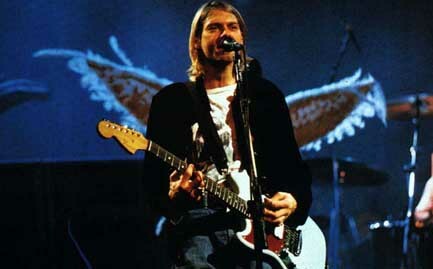 Please buy all of the Nirvana CD's to show your support to Geffen and Nirvana. Personally I would love to see Geffen put more music out, even if its music I've heard before. Please do not distribue or use these for any other purpose.